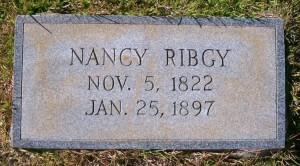 Nancy Rigby headstone – wife of John Rigby, 35th Georgia Infantry Regiment. See link below for image credit. What they did not know was that early on the morning of May 6, 1864, Rigby and his fellow Georgians manned the Confederate line along the Orange Plank Road that sliced through the tangled undergrowth of a place in central Virginia named The Wilderness. Then suddenly, surrounded on three sides by Yankees, the Georgia Confederate line [Edward L. Thomas’ brigade] broke amidst the smoke and a hail of bullets. In the chaos, something hit Rigby and he went down, wounded again. He had been shot two years before in the right thigh and left breast which had collapsed a lung. This initial wounding kept him out of action for six months while he recovered. Yet his arrival at the notorious Federal prison located in Elmira, New York would begin the most desperate struggle of Rigby’s life. He died at “Hellmira” nearly a year after his capture and almost a month after the surrender of Robert E. Lee’s army at Appomattox. Headstone for Pvt. 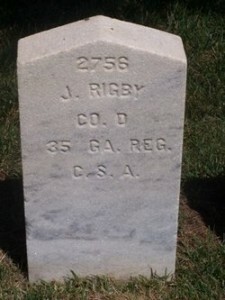 John Rigby, Co. D, 35th Georgia Infantry Regiment, Woodlawn National Cemetery at Elmira NY. See link to left for image credit. 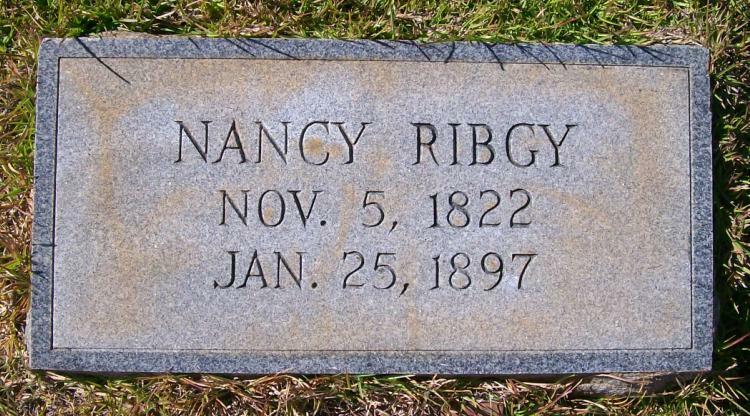 The family of the 35th Georgia Infantry Regiment’s John Rigby finally had their closure on his demise. Red Clay to Richmond: Trail of the 35th Georgia Infantry Regiment by John Fox, Angle Valley Press, 2004, p. 327. Quote from Elmira: Death Camp of the North by Michael Horigan, Stackpole Books, 2002, p. 198.